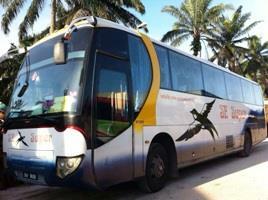 SE Super Express is one of the most popular bus company based in Klang. They provide express bus service with experienced and well-trained work force to provide passengers the safest, most comfortable journey. SE Super express has been in operation for more than 20 years and has vast experience in providing express bus service in areas of Klang, Seremban, Shah Alam, Jerantut and Singapore. Their strong presence in areas of Klang, Seremban, Shah Alam, Jerantut and Singapore has made them one of the favorite bus choice for locals. SE Super counters in Seremban, Klang and Shah Alam are located in the bus terminal of respective cities. As for their Singapore counter, they appointed the another branded bus company Grassland as their sole agent in Singapore. Therefore the check in counter in Singapore is at Grassland Counter in Golden Mile Complex at Beach Road. By joining BusOnlineTicket.com, SE Super Express can now offer the online booking service for the tourists and residents staying in Klang area .SE Super Express also run weekend bus service from Singapore to Klang and Shah Alam.